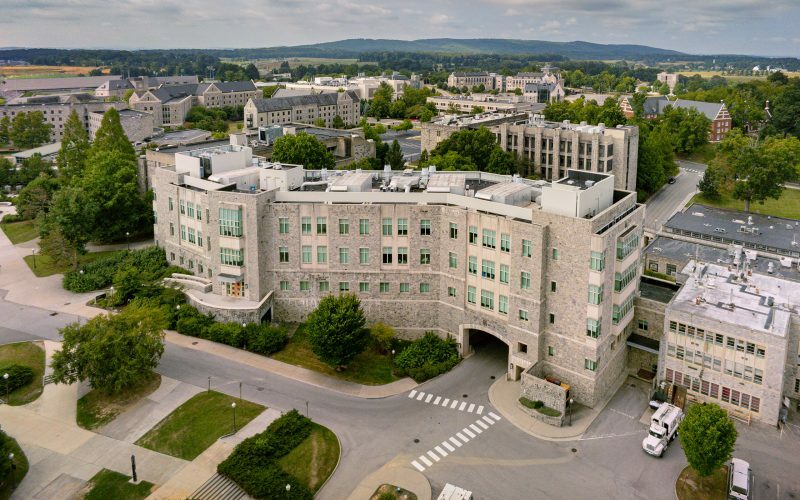 The Fralin Life Science Institute is an investment institute committed to supporting research, education, and outreach in Virginia Tech’s life sciences community. Residents of the institute's four flagship buildings are automatically considered affiliated faculty members and all other life science researchers on campus are invited to become affiliated faculty members. Affiliated faculty members are given resources necessary to explore new, innovative science that benefits people in the New River Valley, the Commonwealth of Virginia, and the world. Through seminars, conferences and research group support, the institute serves as a meeting point for progressive ideas involving multidisciplinary research. It is closely aligned with Virginia Tech’s other six research institutes, which include the Virginia Tech Carilion Research Institute, Virginia Tech Transportation Institute, the Institute for Critical Technology and Applied Sciences, the Biocomplexity Institute, the Institute for Society, Culture and Environment, and the Institute for Creativity, Arts and Technology. The Fralin Life Science Institute strategically invests in targeted research areas within the life sciences. Such investments include recruitment and set-up support for new faculty members, retention and recognition of established faculty members, seed funds for new research projects, equipment purchases, graduate student recruitment and support, undergraduate research support, and support for outreach activities. Research initiatives within the life sciences receiving the highest priority for support include vector-borne disease, infectious disease, plant sciences, ecology and organismal biology, obesity, and cancer biology. The Fralin Life Science Institute is also actively engaged in cooperative partnerships with colleges, departments, and other institutes that also support the life science community. The Fralin Life Science Institute was formed in August 2008 and represents an administrative merger of the Fralin Biotechnology Center and the Institute for Biomedical and Public Health Sciences. The Fralin Biotechnology Center was established in 1995 to promote research, education, and outreach related to the life sciences at Virginia Tech. The Institute for Biomedical and Public Health Sciences was created in 2003 to provide strategic support to enhance biomedical research at Virginia Tech. Given the similar missions of the Fralin Biotechnology Center and the Institute for Biomedical and Public Health Sciences, an administrative merger offered the opportunity to create a single entity that can be effectively managed while significantly reducing administrative costs. The Fralin Biotechnology Center’s strong commitment to public service in the area of biotechnology and undergraduate education has been preserved. The merger also empowers the institute to achieve the primary mission of the Institute for Biomedical and Public Health Sciences. Three laboratories in Fralin Hall are being renovated to form a new insectary that will contain two warm rooms, two workrooms, and an anteroom. This insectary will increase the research capabilities of a number of investigators within the Vector-borne Disease Research Group. The Institute helped to develop the Global Change Center, which is housed within the Institute, and will focus on five emerging global threats: habitat loss, pollution, invasive species, disease, and climate change. The Institute purchased a new confocal microscope to replace the microscope that was housed in the Fralin Imaging Core facility and is used by faculty and students across campus. John McDowell began serving as co-director of Fralin Life Science Institute. New equipment was purchased for the Virginia Bioinformatics Institute (VBI) Core Laboratory. A portfolio highlighting Virginia Tech life science researchers was compiled. The Institute provided seed funding to develop a white paper on the establishment of a Global Change Center and participated in the development of a Beckman Foundation proposal, which seeks funding to provide support for undergraduate research in the area of Global Change.